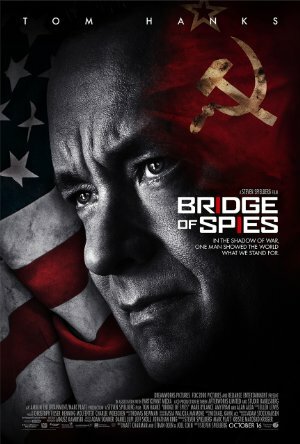 Steven Spielberg’s Bridge of Spies tells the story of how a Russian spy named Vilyam “Willie” Genrikhovich Fisher and an American U-2 pilot named Gary Francis Powers wound up being exchanged for each other during the Cold War. While the movie is labeled as “Inspired by True Events” it is worth noting that the few alterations of what really happened in no way detract from this telling. In an excellent script from Matt Charman and the Coen Brothers, Bridge of Spies opens in 1957 when a man known as Rudolf Abel (Rylance) is captured by the FBI. Because even an accused Soviet spy must be given an adequate defense before being convicted, the Bar Association selects James Donovan (Hanks), an insurance lawyer to defend him. He had criminal trial experience, having served as part of the prosecution team at the Nuremburg trials. Donovan does his best but the “fix” was clearly in as evidenced by the actions of Judge Mortimer Byers (Matthews) before and during the trial. But Donovan is able to convince the judge not to sentence his client to death, arguing that Abel might be useful in the future to exchange for an American captured by the Soviets. Air Force Lieutenant Gary Francis Powers (Stowell) passes a lie detector test and an extensive background investigation before being seconded to the CIA for a highly classified mission. To overfly the USSR in a U-2 reconnaissance aircraft, equipped with the most powerful cameras ever used in aerial spying. He and the other pilots are briefed that they cannot allow the airplane or themselves to fall into Soviet hands. To ensure this, the plane is equipped with a self-destruct switch and the pilots are given a way to easily kill themselves. Following the Soviets shooting down the U-2 flown by Powers, he is captured, tried and sentenced to ten years in a Soviet prison. We see him in what is intended to portray the dreaded Lubyanka Prison in Moscow undergoing intense interrogation. While the U.S. had had no success in getting Abel to talk, both sides were worried that their man in the custody of the enemy would eventually begin to disclose the highly classified information they had. This led to James Donovan journeying to East Berlin to negotiate an exchange where both men could be returned to their own countries. Add in the wrinkle of American citizen Frederic Pryor (Rogers) being taken into custody at the moment the Berlin Wall is going up and things get really complicated. There a number of factors that make this an excellent film, even by the elevated standard one comes to expect from a genius like Steven Spielberg. The first is the incredible attention to detail in accurately portraying the era of the late 1950s/early 1960s. While this is the first time in three decades that John Williams was not the composer of music for a Spielberg film (he was unavailable due to illness), Thomas Newman did a very good job. He’d been the conductor for Saving Mr. Banks and his score was perfectly suited to the movie. The casting was better than first-rate. Putting Tom Hanks in a Spielberg film is a no-brainer but selecting Mark Rylance, primarily a stage actor was awesome. His performance as Rudolf Abel is definitely worthy of award consideration. Mikhail Gorevoy as a top-level KGB official and Sebastian Koch as an East German lawyer were quite excellent. Also worthy of notice is Laurie Dawn who appears in two brief scenes on the subway and doesn’t say a word aloud. But she speaks volumes with just her facial expressions. Top-notch filmmaking! A couple of historical notes about the real story versus the way it is told in this film. There are things here that most would consider spoilers. You’ve been warned. The investigation, arrest and conviction of Rudolf Abel was known as The Hollow Nickel case. One of the nickels used by the Soviets for passing secrets back and forth wound up in the hands of a newspaper boy. When he found it was hollowed out he turned it over to police. Gary Francis Powers was a Captain in the USAF, not a lieutenant as depicted. Further, he’d been discharged from the Air Force before he began working for the CIA. That actually took place in 1956, almost a year before the arrest of Rudolf Abel. It was actually 21 months from the time Powers was shot down until he was exchanged for Abel on the bridge in Berlin.